Norwegian explorer of polar regions (1872-1909). 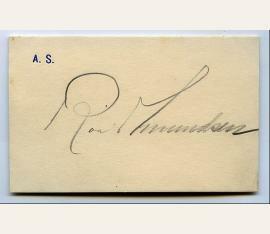 Autograph Letter Signed ("Roald Amundsen") Kristiania. 4to. 1 page. On Amundsen's stationery. 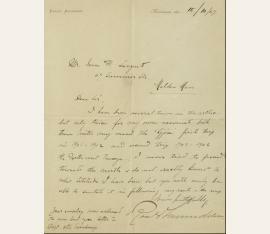 Amundsen responds to a request from Isaac N. Sargent of Malden, Massachusetts for information about his voyages: "I have been several times in the Arctic but only twice for my own account both times with my vessel the 'Gjoa' first trip in 1901-1902 and second trip 1903-1906[.] ... 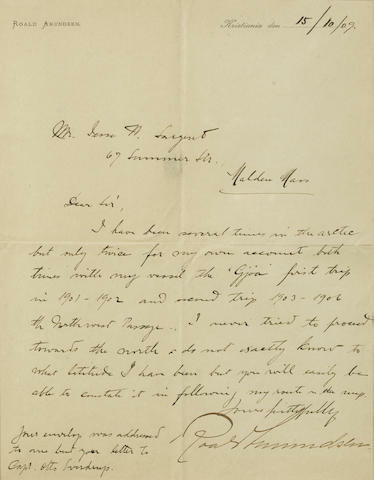 I never tried to proceed towards the north and do not exactly know to what latitude I have been but you will easily be able to construct it in following my route on the map." - Matted and framed with portrait photograph of Amundsen. Roald Amundsen (1872–1928), Polarforscher. Albumblatt mit e. U. O. O. u. D. 1 S. Qu.-8°. – In Bleistift. – Auf Briefpapier mit gepr. Monogramm A. S.